A need for STEM Education? Recently, I was reading an article titled "How Technology is Destroying Jobs" published in the July/August MIT Technology Review. While this article has no direct connection to K-12 education, I found it to be quite relevant. The article summarizes ways in which technologies like the Web, artificial intelligence, big data, and improved analytics are automating routine tasks and eliminating traditional white-collar jobs. ln the article, David Autor, an economist at MIT points out that computers are taking over tasks like bookkeeping, clerical work, and repetitive production jobs in manufacturing, while jobs requiring creativity and problem solving-skills aided by computers have proliferated. These new technologies are widening the income gap between the tech-savvy and everyone else. I began to contemplate the implications of this concept… the need for software engineers and computer programmers is growing exponentially, which means a greater need for science, technology, engineering, and math education. According to the 10-year employment projections by the U.S. Department of Labor, of the 20 fastest growing occupations projected for 2014, 15 of them require significant mathematics or science preparation. However, if we adequately educate our students in math and science but do not teach them creativity or problem solving skills, how can we expect these students to apply their knowledge once in the workforce? 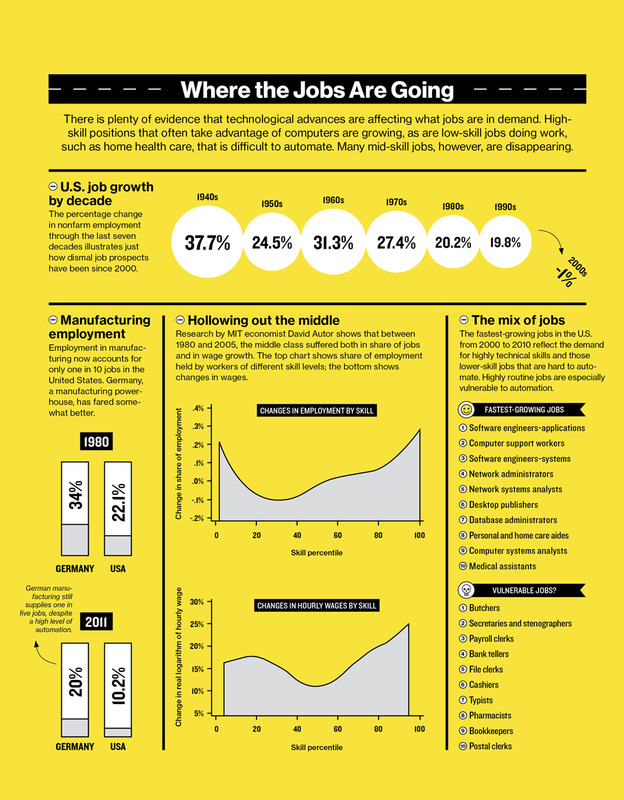 The fastest-growing jobs in the U.S. from 2000 to 2010 reflect the demand for highly technical skills and those lower-skill jobs that are hard to automate. As educators, we must instill a spirit of exploration and innovation in our students. STEM education should be more than just teaching science, technology, engineering, and math, we must teach our students to think critically and creatively in all academic areas. This article clearly illustrates how economic growth in the 21st century will be driven by our nation's ability to both generate ideas and translate them into innovative products and services. Here are some resources that emphasize STEM education, as well as creativity and innovation. The Design Squad Nation website is an online community that grew out of the Design Squad television series that aired on PBS KIDS. The site for educators, parents and engineers provides lesson plans, activities, animations, video profiles, and episodes that target kids ages 8 and older. The goal of Design Squad is to give kids a stronger understanding of the design process, and the connection between engineering and the things we all use in everyday life. 3M and Discovery Education partnered to bring the Science of Everyday life into your classroom. Lesson plans, activities, interactives, videos and more are designed to capture students' curiosity and engage your classroom in the scientific thinking process; while having fun! Aligned to national standards, these exciting inquiry-based lessons address key areas of life science, physical science, earth science, technology and innovation using common materials you can find in your classroom. eGFI stands for “Engineering, Go For It!” and it is sponsored by the American Society for Engineering Education. An interactive website, magazine, teacher and student newsletter and resources all promote and enhance K-12 STEM education. Teachers TryScience provides teachers with free and engaging lessons, teaching strategies and resources which are designed to spark students’ interest in science, technology, engineering and math. What’s more, the site features collaboration tools to enable teachers to discuss and share effective instructional practices.